Periodontal (gum) disease is as common as it is destructive. Almost half of all adults 30 and older have some form—and those numbers increase to nearly three-quarters by age 65. Fortunately, we have effective ways to treat this bacterial infection, especially if we catch it early. By thoroughly removing all plaque, the disease-causing, bacterial biofilm that accumulates on tooth surfaces, we can stop the infection and help the gums return to normal. Unfortunately, though, you're at a greater risk for a repeat infection if you've already had gum disease. To lower your chances of future occurrences, we'll need to take your regular dental exams and cleanings to another level. Although everyone benefits from routine dental care, if you've had gum disease you may see these and other changes in your normal dental visits. More frequent visits. 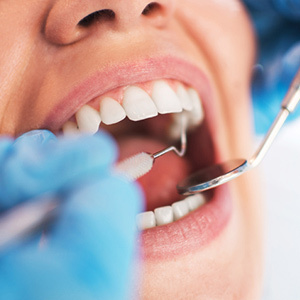 For most people, the frequency norm between dental cleanings and exams is about six months. But we may recommend more visits for you as a former gum disease patient: depending on the advancement of your disease, we might see you every three months once you've completed your initial treatment, and if your treatment required a periodontist, we may alternate maintenance appointments every three months. Other treatments and medications. To control any increases in disease-causing bacteria, dentists may prescribe on-going medications or anti-bacterial applications. If you're on medication, we'll use your regular dental visits to monitor how well they're doing and modify your prescriptions as needed. Long-term planning. Both dentist and patient must keep an eye out for the ongoing threat of another gum infection. It's helpful then to develop a plan for maintaining periodontal health and then revisiting and updating that plan as necessary. It may also be beneficial to perform certain procedures on the teeth and gums to make it easier to keep them clean in the future. While everyone should take their oral health seriously, there's even greater reason to increase your vigilance if you've already had gum disease. With a little extra care, you can greatly reduce your chances of another bout with this destructive and aggressive disease.